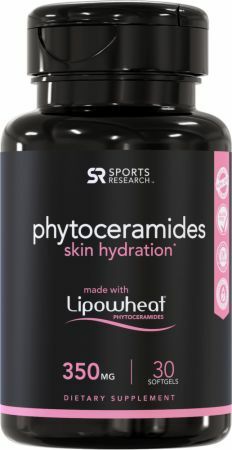 Sports Research Phytoceramides Skin Hydration at Bodybuilding.com - Best Prices on Phytoceramides Skin Hydration! Sports Research Phytoceramides are formulated with clinically studied, double-patented Lipowheat®, a non-synthetic, plant based form of ceramides. For women and aging, our skin is very important. After about 3 months or longer of taking this, I have found my skin more hydrated and more youthful looking overall. I rated a 9 because I haven't tried another brand to compare, but all of my research has pointed to this brand and I don't believe I'll change. When your skin looks and feels younger, your overall confidence peaks. I would definitely recommend this to a friend. ALLERGEN WARNING: Contains Wheat (Non-GMO). Directions For Phytoceramides Skin Hydration: As a Dietary Supplement, healthy adults take 1 liquid softgel per daily with food. Best when taken as directed by a qualified healthcare professional. Warnings: KEEP OUT OF REACH OF CHILDREN AND PETS. Consult with a qualified healthcare professional prior to using this product, especially if you are pregnant, nursing, have a diagnosed medical condition, or are taking prescription medications. Do not exceed recommended daily intake. Do not use if safety seal is damaged or missing. Store at room temperature in a dry place. Protect product from excessive heat, freezing, humidity, and light. Check out other Anti-Aging Support Products.